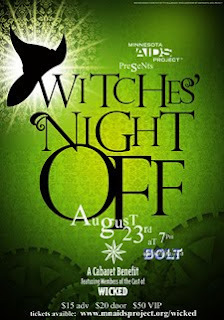 Last night I attended a concert called Witches' Night Off, a cabaret performance by the touring cast of Wicked to raise money for the Minnesota AIDS Project. As I mentioned in my Wicked review, this cast is hugely talented, so it was fun to see them all have their chance to shine. I recognized some people from the show, but they look quite different without their crazy fabulous Oz costumes and hair. About a dozen or so cast members took part in the show. None of the principals were there (I'm sure they use their day off to rest their voices), with the exception of Rachel Potter, Glinda's understudy who I saw perform on Sunday. Performances ranged from showtunes (including a duet of "Take Me or Leave Me" from RENT) to pop songs to dance numbers, and what beautiful dancers they are! The concert was held at the Bolt Underground in Minneapolis - a bar is not my favorite type of venue. It was loud and crowded and seating was limited. In retrospect I wish I had sprung for the $50 VIP seats; it would have been well worth it and the money goes to a good cause. Instead I was standing in the back craning my neck and getting jostled by the crowd. But it thinned out as the show went on and I found a seat. They auctioned off several cool items from the show, including Glinda's purse! Another auction item was the opportunity to be painted green and sing "Defying Gravity" with the cast. If only I had known it included the singing part I might have gone for it! I would have made a prettier Elphaba than the man who won. ;) But I must admit he did a pretty good job with the song. Unfortunately the auction parts dragged on and only made me wish I could fast-forward to the performances! All in all it was a fun night and a great opportunity to watch this cast strut their stuff in a way they can't as part of the ensemble. I'm tempted to go see Wicked one more time before it leaves town; who knows when it will be back again! I would have made a prettier Elphaba than the man who won. it sounds like it was a fun time. it must have been hard to really get settled at a bar, but at least it sounds like it was lively.